It's National Hand Hygiene Day! It’s National Hand Hygiene Day! There’s so much going on when you’re a kid – mud pies to make, friends to play with, frogs to catch and toys to share. With all this activity, it’s easy for children to forget to wash their hands. Hand-washing is one of the best ways to avoid germs, bacteria and viruses that can cause illness. 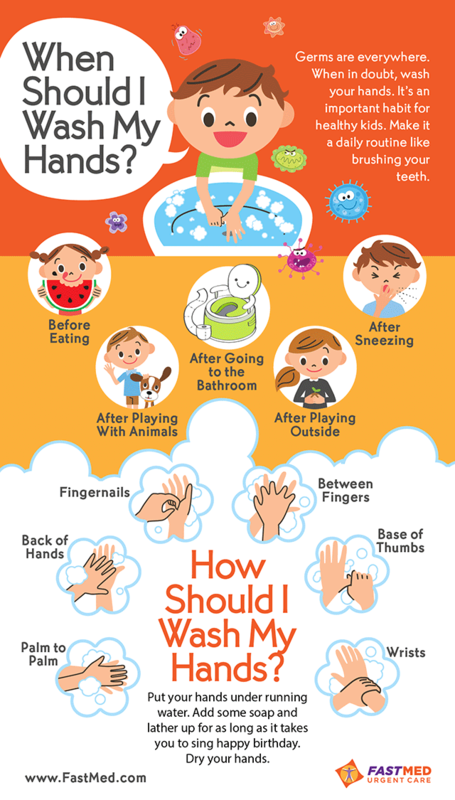 Print out this infographic and place it in a prominent location (like in the bathroom or on the fridge) to remind your child of the proper hand-washing technique. And remember, it’s not just for National Hand Hygiene Day; regular hand-washing should be a part of the daily routine for both adults and children. Parents and caretakers, don’t forget that these guidelines apply to you, too! Keep yourself and your little ones healthy by regularly washing your hands. If someone does get sick, come to your local FastMed Urgent Care. We’ll get you all fixed up in no time!